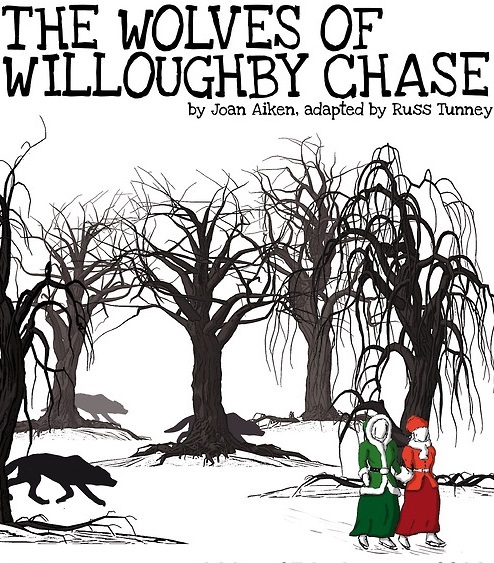 Here is the first opportunity to see Russ Tunney’s brilliant adaptation of Joan Aiken’s The Wolves of Willoughby Chase live on stage since it was published as a Nick Hern playscript earlier this year. Originally performed by a cast of five unbelievably quick change artists for a very successful tour around Southern England by Forest Forge Theatre company, this lively, funny, scary and above all faithfully Aiken adaptation is coming to The Progress Theatre Reading, for a couple of weeks only this month from 16th to the 25th of January – tickets going like hot cakes so if you are anywhere near Reading, England do book now! MRS BRISKET. Show the nice man from from Ofsted our advanced literacy: The Cheese Alphabet! and Z is for Zanetti Grana Padano. INSPECTOR. Incredible! They really know their cheeses! three R’s. Reading, Writing and Really tasty snacks. This entry was tagged Joan Aiken On Stage, New Aiken Play, Nick Hern Plays, Progress Theatre, Reading, The Wolves of Willoughby Chase. Bookmark the permalink. ‘Reading, Writing & Really Tasty Snacks’! That sounds a wonderfully crazy addition, and quite in keeping. Lucky anyone who can get to see it – a bit to far away for me, sadly. Aaaah, that’s a shame, but thanks for the tweet! Smiled at the cheese alphabet — especially as the usually ubiquitous Cheddar was deliberately shunned! Thinking of edibly working my way through that Cheese Alphabet – New Year’s project! Though I wouldn’t like to do it with as Ofsted inspector looking on.